Pentagon Revealed What Kind Of Arms It Will Supply To Kurdish Forces In Syria 4.3333333333333 out of 5 based on 6 ratings. 6 user reviews. Operation Inherent Resolve spokesman Col. John Dorrian revealed Wednesday what kind of arms the United States will supply to Kurdish forces in Syria. The United States will soon start supplying arms to Kurdish militias operating within the US-backed Syrian Democratic Forces (SDF). The SDF will soon be involved in the advance on the ISIS self-proclaimed capital of Raqqah. Dorrian revealed that Kurdish forces will receive ammunition, small arms, heavy machine guns and mortars from the United States. “So what we are talking about here is ammunition, small arms, heavy machine guns and mortars will be included,” he told reporters. Earlier this week, the Pentagon announced that US President Donald Trump had approved a plan to directly arm Kurdish forces operating in Syria. Not exactly the heavy weaponry I had in mind. Still a hefty supply of US TOW missiles would be as great a nightmare to Turkish troops as it is to Syrian troops. Worse even as the Turks seem to lack any protective armor, active or passive against such missiles. At least most Syrian armor drives around with ERA. Not even the Turkish army Leo 2’s carry anything other then their standard armor. Most Syrian armour does not in fact drive around with ERA, Lepoard 2s have decent armour and M60 SABRAs have ERA. But yes, the rest would be more than vulnerable. Aren’t all TOWs tandem warhead at this point? Is whatever ERA Turkey is using (and whatever spaced armor or NERA the Leopards 2A4 have) enough to handle them? Trump is arming SDF against ISIS, not Turkey. If Turkey attacks, Trump will handle them himself with F-22. You mean the F-22s that are based in….Turkey? Trump is going to attack with those F-22s? Might as well, though they should be ready to land in Greece or Tabqa, when done. Of course, a shuttle/attack flight mission! Maybe Syria can give them a few M30’s (122mm howitzers, model 1938). How about hell no. The Kurds deserve no weapons at all. The only side that should receive support is the Syrian Government. Not some terrorists like al qaeda, fsa and the kurds. Your obsession with killing children, in post after post, reveals your satanic evil. Jesus Christ, True God, will judge you when you die. Jesus got what he deserved, life of hell rotting on a cross. Hell yes! Biji Kurdistan azad! +1…Sooner or later the US will execute their plan on Syria in a big way. This Kurd gambit is only an excuse for controlling and eventually taking part of Syria. The only real question is if the Kurds will follow their US bosses or go with making nice with Syria. Why people think arming multiple factions will work out, I have no idea. This only makes peace more problematic. If people think that the Kurds can be trusted, just remember that Kurds were in bed with Erdo and IS in stealing Syrian and Iraqi oil. Not to mention the end result of more weapons being ‘lost’. The only ones that should deserve weapons is the Syrian Government. The syrian government could not protect the kurds from ISIS. The kurds had to take matters into their own hands or they would be genocided. It’s not like the syrian government had control of their areas and was ensuring their safety but they rebelled against them. Nothing like that. One also has to remember that the Kurds were part and parcel of the oil stealing, in collusion with ISIS/Turkey. The Kurds are part of the US plan to federalize (Balkanize) Syria. Gotta have that KSA/Qatar pipeline. That stuff both lacks the armor to fight ISIS and is small enough to hand off to PKK and smuggle into Turkey. All would be better off if they had 500 M-1s. Which can fight ISIS AND are hard to smuggle. You forgot to mention abortion rights, for some reason. Yeah, that’s what we need to do…give another questionable group more high tech and devastating weaponry. You’d think we have learned at least something from arming Al Qaeda. Give those weapons to Syria if defeating ISIS is the goal. The kurds arent as alkaeda or ISIS they want to live with their self rules in an autonomous state, they are the ancestral owner of their land and they don’t steal anything to anybody but just take what they deserve. By giving the weapons to kurds may be Rojava a progressive and liberal state could develope, while by giving them to FSA or Syrian Government one only support murderer clans. Don’t forget that kurds fight for their freedom while the real terrorists are Alkaeda, ISIS, ASSAD , the AKP-Erdogan government, the Iranian regime, and finally as new entry the BArzani clan. not Syria. When the war is over we will see what happens to them. SDF is the best and least questionable proxy the US has found in over 50 years, and is bringing abortion rights to Raqqa, unlike SAA; though like Russia. So, they are going to ‘storm’ Raqqa with mortars? Good luck fellas. This has got to be some kind of baloney or somebody, in the WH or DoD, is smoking crack. With all due respect, I don’t buy that statement at all. The US are playing with them. They give the Kurds some light weapons to “fight” ISIS and not to “injure” the Turkottomans. The SAA deserves these weapons, not the Kurds. Who has been more successful in driving out daesh and the other militants from Syria in the past few months? SAA!!! The Kurds have been trying to take tabqa/raqqa since then and barely the map there changes. Either they are totally retarded or they are being given orders by the US to go very slowly for some reason. If they’re going to arm the Kurds, why not arm the SAA as well? 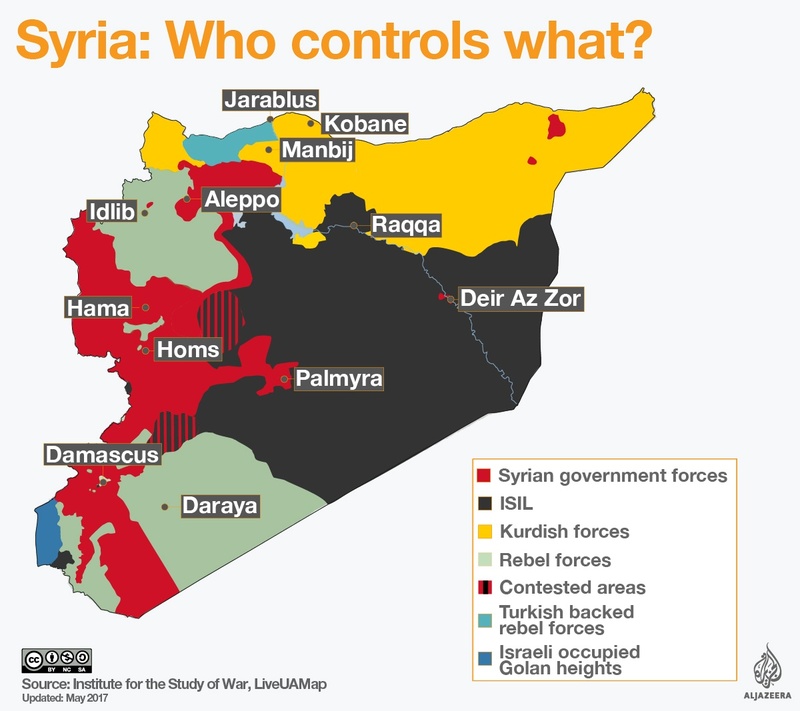 The SAA is not successful enough judging by the above map. “Red” will become greater and greater. And “Red” has almost all big cities. ISIL weakens more and more and in the near future, Iraqi forces will help “Red” to gain more and more territories. I do like the ‘Red’ colour but I like the colour of ‘Yellow’ even more so ? If the Kurds were to execute a sustained attack on ISIS, the US might not be able to ferry most of the terrorists out to safety, as they have done previously. The Kurds and especially Turkeys ‘war’ on ISIS is mostly staging and resource management. The same is happening in Mosul. Only these?who are they kidding?the ISIS are not kids with plastic weapons playing war.i think the US is afraid of Turkey so they dont give antything to the Kurds that Turkey doesnt want them to have. it amazes me how a madman like erdogan can manipulate the US even threaten them. The declaration of Dorrian is nowhere to find except here ?